The history of medieval Dublin is extraordinarily rich and complex. This book is a tribute to some of Ireland’s most distinguished medieval scholars and a further contribution by The Friends of Medieval Dublin to their diffusion of knowledge of the history of this remarkable city. From its origins as a monastical settlement and later as a Viking kingdom, to its identity as an English colonial capital, medieval Dublin passed through many incarnations. It has been, alternately, a pirates’ lair at the center of a brutal slave trade, an emergent town ransacked periodically by its Irish neighbors, a rapidly expanding municipality headed by a mayor, and the principal focus of loyalty to the crown in a beleaguered Pale. The history of medieval Dublin is extraordinarily rich and complex. 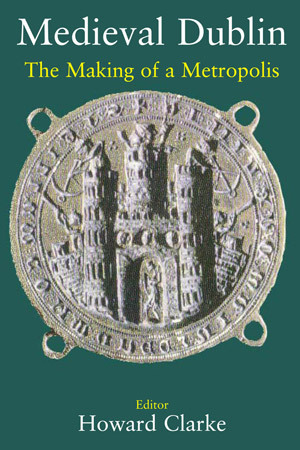 This book – now available in paperback after many years out of print – is intended both as a tribute to some of Ireland’s most distinguished medieval scholars and as a further contribution by The Friends of Medieval Dublin to their declared policy of diffusing knowledge of the history of this remarkable city. Dr Howard Clarke, now retired from UCD, is one of Ireland’s foremost scholars on medieval Dublin, and has written extensively on this subject.